And earlier in the week, we spoke with Warren Suss, who has been watching the government market for decades… he joined us this week to talk about how the doing more with less is actually causing fundamental changes in the government market. OH… an update on GSA’s March Madness brackets — no, not basketball. 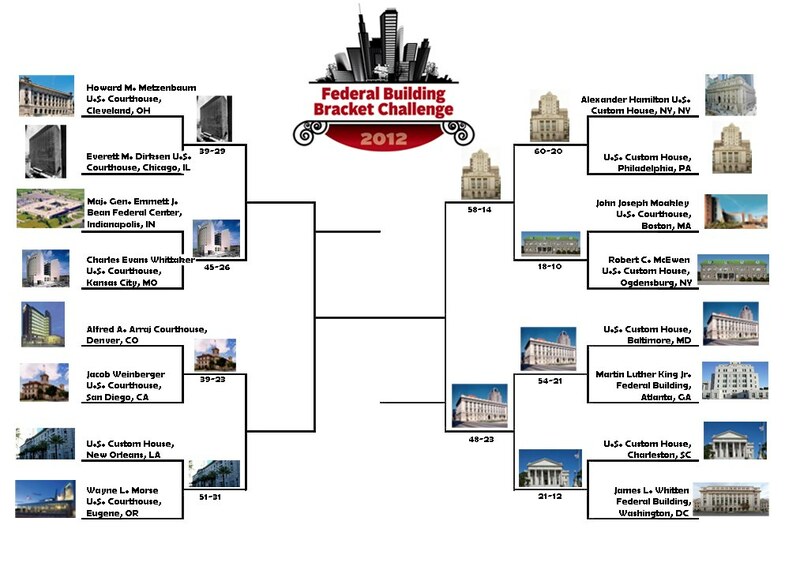 We told you earlier this week that GSA has brackets for your favorite federal architecture. We have the update… The final four starts today — and you can cast your vote… Vote on GSA’s Facebook page: www.facebook.com/GSA. Up front today… two interesting items that sure show how times are changing. One… would would guess we would ever say Bon Jovi, the Department of Veterans Affairs, and the Department of Urban Development together in one phrase? Well, welcome 2012. VA and HUD have unveiled a new federal app challenge designed to help homeless veterans quickly find shelter and other kinds of assistance. TechPresident reports that the mobile app will, essentially, act as a travel portal for homeless veterans. And Bon Jovi said that the idea for the project came to him after a volunteer at the JBJ Soul Kitchen in New Jersey asked for help finding a bed for the night. The other story that shows how times have changes — or are changing and will change… Imagine if the CIA could spy using your washing machine… or dryer. Wired says that those intelligent household devices may be able to be tapped. And CIA Director David Petraeus has said that the Internet of PCs is leading to the Internet of things — devices of all types. And that could be tapped. And it is a legally gray area. The changing face of federal IT and its acquisition process. What happens to hardware in your office when it’s no longer fit for service? Hit the dumpster? You’ll learn what GSA wants you to do. The challenges of making legal documents available online. We’ll talk to a professor who has studied the issue.